John Ringo brings fighting to life. He is the creator of the Posleen Wars series, which has become a New York Timesbest-selling series with over one million copies in print. The series contains A Hymn Before Battle, Gust Front, When the Devil Dances, Hell’s Faire, and Eye of the Storm. In addition, Ringo has penned the Council War series: There Will be Dragons, Emerald Sea, Against the Tide, and East of the Sun, West of the Moon. Adding another dimension to his skills, Ringo created nationally best-selling techno-thriller novels about Mike Harmon (Ghost, Kildar, Choosers of the Slain, Unto the Breach, A Deeper Blue, and, with Ryan Sear, Tiger by the Tail). His techno-thriller The Last Centurion was also a national bestseller. A more playful twist on the future is found in novels of the Looking-Glass series: Into the Looking Glass, Vorpal Blade, Manxome Foe, and Claws That Catch, the last three in collaboration with Travis S. Taylor. His audience was further enhanced with four collaborations with fellow New York Times best-selling author David Weber: March Upcountry, March to the Sea, March to the Stars and We Few. 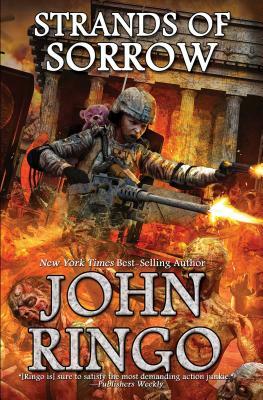 There are an additional five collaborative spinoffs from the Posleen series: The Hero, written with Michael Z. Williamson, Watch on the Rhine, Yellow Eyes and The Tuloriad, all written with Tom Kratman, and the New York Times best seller Cally’s War and its sequels Sister Time and Honor of the Clan, all with Julie Cochrane. In addition, Ringo’s Princess of Wands and Queen of Wands broke new ground in contemporary fantasy adventure. And his science-based zombie apocalypse Black Tide Rising series includes Under a Graveyard Sky, To Sail a Darkling Sea, Islands of Rage and Hope, and Strands of Sorrow. A veteran of the 82nd Airborne, Ringo brings first-hand knowledge of military operations to his fiction.